Which bass guitar should I purchase? This is a question I asked myself many times, and you’ll find the same question all over the place on the Internet, with varying answers. Obviously, the answer is highly subjective. Finding my own subjective answers has cost me many years and dollars, but I finally feel like I know a thing or two about bass guitars and how to decide which one to purchase. I would like to share my experiment of getting there so you don’t waste the hard earned money of you or your dad / husband / wife / etc for nothing. Actually, any guitar can be used in any genre – as long as it contributes to the most important aspect of them all: “Music is what feelings sound like”. Your play style, your bass guitar and your gear should work in harmony to produce the sound(s) to express how you feel. Music is the language of the feelings, melodies are sentences, your play style is your accent, and your gear is your voice. They should all be in harmony. Music is what feelings sound like. This should be the central concept of everything else about music. If you have a not-so-traditional playing style to contribute your feeling, don’t hesitate experimenting with a non-traditional combination of genre-guitar-gear to make it a whole. If a traditional combination suits you, so be it. Within this context; stereotyped generalizations, such as “Everything but Fender Precision is a toy” or “StingRay is best because Tony Levin plays it!” can be safely ignored. There will always be trolls trolling about your decision, but success beats them all. I think you can clearly see the invalidity of stereotypes such as “Jazz Bass can’t be used for metal noob!!!111! !11!” when, in fact, bassist of Sepultura uses a Fender American Deluxe Jazz Bass. It doesn’t make the guitar the absolutely best choice for metal, but someone made it a successful tool of that genre, so it is possible. Also be careful about the comments of the salesman. He wants to lighten up your coin purse by selling you a bass guitar; so there is a fair chance that his comments might be biased. Always keep in mind that your bass guitar and your gear are merely tools. Don’t overrate them. If you are making music, at least 51% of the whole is “having something to say” and to express it. The “something” is an emotion, a feeling that you sincerely have and want to express to others. Everything else should contribute to the feeling you want to express; everything else is a tool of expression, elements of a beautiful language called “music”. Let’s inspect the elements of this language – starting with the tone of your bass guitar. Body wood, neck wood, pickups, and electronics (active / passive) are the most significant elements of getting the raw tone. Ash bodies and maple necks will produce brighter, more sparkly tones, while alder bodies and rosewood necks will produce darker, more mellow tones. Pickups closer to the neck will highlight darker tones, while pickups closer to the bridge will highlight lighter tones. Single coil pickups will produce a more controlled sound, while humbucker / soapbar pickups will put the sound on steroids. Metal choice of pickup magnets will make a difference as well – you could have to make a choice between alnico and ceramic. Finally; passive electronics will produce a weaker output where bass / mid / treble can only be cut, while active electronics will produce a stronger output where bass / mid / treble can be cut or boosted. Effect pedals and amp settings will also contribute to your tone, but make sure that you are satisfied with the raw sound of your guitar first. Strings have a significant effect as well, but they can be easily replaced so we ignore them for now. There is a huge number of possible combinations between those basic parameters. So, achieving your own personal sound(s) is all about learning more and more about those parameters and how they contribute to the overall “feeling” when recording, practicing, playing live, etc (yes they might differ from situation to situation). Anyway… Combining the factors of sound and playability, here is my strictly subjective table of bass guitar – genre combinations. The genres I actually play are marked with bold, and I have only included the bass guitars I had the chance to experiment with. However; in a purchase decision, fitting the sound with the genre(s) in question isn’t the only parameter. Other features of the guitar are also important. 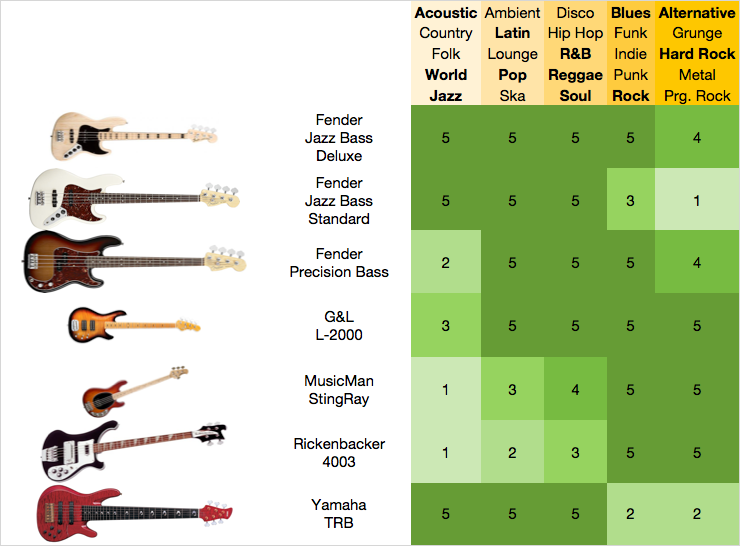 Here is another table which covers some of my strictly subjective criteria of evaluating a bass guitar. Over time, you should build your own set. I am an ex-guitar player who plays a huge variety of genres in different bands. I slap occasionally, and like modern / traditional sounds equally – depending on what I’m doing. I tend to play melodic bass lines and fills based on the roots and contribute unisons a lot – so I like to cut through the mix when I want to. 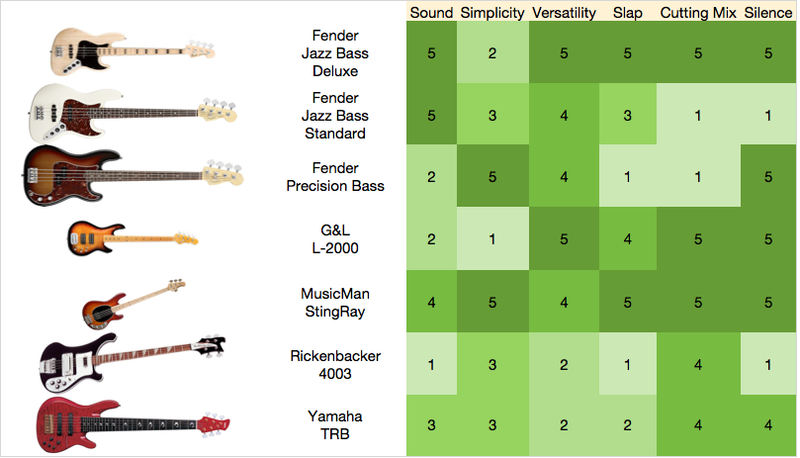 Considering my play style, here is a quick subjective overview of the bass guitars in the chart. Don’t consider this as an objective evaluation – and don’t make your bass investment based on what I say. I am doing this overview to demonstrate how a bass purchase decision should be made. Basically, you should build your own set of dimensions and compare them to your personal requirements by asking how they contribute to your musical language. My opinions are not objective and will probably not fit the needs of the next player (thats you). Fender American Deluxe Jazz Bass is the perfect bass for my needs and play style. I used to be a guitar player, so the thin neck feels like home. In passive mode, it covers the lighter genres nicely. The bridge pickup is nice for the Jaco-ish sound, while the neck pickup is nice for the Precision-ish sound; on the other hand, I never use a pickup alone, I always blend them in varying degrees. With one switch, I can jump to active mode for a few reasons: Lack of an amp (so I need EQ), need of changing tone from song to song without walking to the amp, or boosting the output to be heard in the mix. If my batteries die in the middle of a gig, I can always switch back to passive and the show can go on. In active mode, I get to blend the pickups like in passive mode and also get a 3 band cut/boost EQ. With the right combination of pickups and EQ, I have yet to find a genre that it can’t fit; on the other hand, if I would be playing only alternative / hard rock / metal, I might lean towards a bass with humbuckers for a little fatter sound. Or maybe a Deluxe Jazz Bass with an alder body – mine is Swamp Ash because bright sounds fit my play style better. For my in-depth review of the Deluxe Jazz Bass, click here. Fender American Standard Jazz Bass is almost the same minus the active electronics. Two pickups (neck / bridge) with independent volumes and a central tone knob to cut the trebles would cover all of my needs for lighter / neutral genres. However; beyond blues / rock, I find it hard to make this bass cut through the mix and be heard next to the drums + loud guitars. If you only play the root notes, are OK with being a little muted behind distortion guitars and have a good reason to insist on a Jazz Bass, this might be what you want. Personally, I tend to play melodically and I want people to hear the subtle notes that I play – even in loud bands missing a bass amp. I also dislike the fact that the pickups of standard Jazz Basses have a natural hum – you need extra effort to make them silent. Fender Precision Bass is the first mass-produced modern bass guitar ever built, and is still popular like day one. Precision Bass has only one pickup underlining the darker neck sound, and basically produces only one bass sound. But it is a sound which practically became an industry standard and goes well with many genres. It’s neck is thicker than a jazz bass (feels like a baseball bat sometimes), so if you have gentle hands / fingers or do a lot of soloing, you might want to look for other alternatives. Achieving different sounds is also very hard with the P-Bass alone, you need extra gear for that. Because the P-Bass lacks a bridge pickup, the slap sound of it is a bit dull – if you slap, you might want to look for alternatives. If you don’t slap, play basic root-based bass lines, don’t want to worry about getting the right tone and are OK with the neck width; a P-Bass might be what you are looking for. G&L L-2000 is a very versatile bass guitar. Just like a Jazz Bass has two single coil pickups, G&L L-2000 has two humbucker pickups. You can switch the active / passive electronics on or off, can select the pickup combination, set them in series / parallel mode for different “sound colors”, and whatnot – there are 18 possible toggle-switch combinations. Although there is a huge variety of tones available in this bass guitar, it is not my axe of choice for the following reasons: 1) I know a thing or two about EQ, but this thing is much more parametric than my needs, making it more complicated than necessary 2) The overall tone of this bass sounds a little “hi-fi” to my taste, especially in active mode 3) I personally don’t like the way it contributes to jazz / acoustic bands. If I would be playing metal more than I play jazz, I could prefer a G&L L-2000 over the Deluxe Jazz Bass due to the fact that it has humbuckers. MusicMan StingRay has been my only bass guitar for many years before I replaced it with a Deluxe Jazz Bass. Just like the Precision Bass, it has a relatively thick neck and one single pickup – placed on a very strategic spot. It has only active electronics and will provide a 2 or 3 band EQ, depending on the model. The basic sound of a StingRay is deep and punchy at the same time – it has an unmistakable “click” and will cut right through the mix like a hot katana on butter. It is a great instrument which will cover almost any style. The foam mutes under the bridge help this fact by providing an old-school tone if activated. What I dislike about it is; it has one basic sound and that’s it. You can alter it using EQ, but it’s not as versatile as a Deluxe Jazz Bass or G&L L-2000. If you don’t like messing with EQ and love how the StingRay sounds like, it might be a good choice for you – it is a sound that will fit into many styles easily. Slappers especially like StingRay’s because they can get a razor edge slap sound. On the other hand, I find it hard to “calm the StingRay down” in lighter styles, such as acoustic and jazz due to the fact that it has active electronics. For my in-depth review of StingRay, click here. Rickenbacker 4003. You either love it or you hate it. It surely has an original look. It has an unmistakable sound which is naturally buzzy / distorted and will create a lot of hum if not controlled. Many bass heroes played Rickenbacker’s so I can’t tell that it is not a good bass. Let’s just say that the natural distorted-sound of the bass doesn’t contribute to “how my feelings sound like”. Especially when playing lighter genres. It might contribute to yours, though. Often seen in six strings, Yamaha TRB series is the axe of choice of many jazz and latin players – including John Patitucci – who like to play solo as much as they play bass lines. It has a distinctive growly sound which is kindof also heard in some Fodera basses, and the 2 humbuckers + active electronics help achieving many alternative sounds. In terms of versatility, it is close to G&L L-2000 and Fender Deluxe Jazz Bass. Except the lack of passive mode. However; high-end models have 6 strings, which means considerable effort is required to achieve a decent dexterity if you played 4-string basses for a long time. The neck is thin, but obviously wide. If a wide neck and soloing a lot is not your thing, you might look for other alternatives. I played a TRB 5, TRB 6, and now have a TRB 4 as a backup bass. If you don’t like EQ and simply want a single tone that fits everything well, you can lean towards a Precision Bass for a more traditional sound (passive) or a StingRay for a more modern sound (active) and start from there. If you want to have an extremely versatile guitar which can produce a huge variety of tones for any style using different EQ settings, you can lean towards a Deluxe Jazz Bass for a more traditional single coil sound or a G&L L-2000 for a more modern humbucker sound. If you are going to slap a lot; a StingRay can be considered as a natural choice; however, many bassists (including Marcus Miller) slaps on a Jazz Bass and they sound great as well. Having huge versatility, G&L L-2000 should do the trick too if you like the sound. If you are in a loud band and you want to cut through the mix easily, you have to look for an active instrument. StingRay is famous for that purpose, and Deluxe Jazz Bass and G&L L-2000 work well too. There are people using Rickenbacker’s in jazz bands and it is OK as long as the sound is in harmony with their play style, other instruments, and how the song feels like. There are people using standard jazz basses in grunge bands and they make it work well. The opinions in this document are my own subjective opinions, which are the result of my own play style, preferences, and feelings. You should have your own subjective opinions by reading, researching, and messing around with many alternative guitars. I hope that this article has inspired you to get free of bass stereotypes and guided you to a more enlightened point of view. Guitars and gear are only tools. Don’t overrate them, and make sure that your feelings, your play style, your gear and the genre in question all work in harmony to contribute to what matters the most: “Music is the language of feelings”. You may continue by checking my Effect Pedal Purchase Guide .